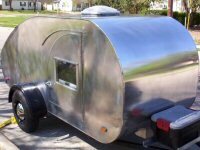 Teardrops n Tiny Travel Trailers • View topic - Wire Size for trailer batteries? Wire Size for trailer batteries? I was reading a thread about wire sizes, but it involved the tow vehicle, alternators, ets. My trailer will be completely independent of the two vehicle. I'll have two batteries in parallel, an AC to DC converter/charger with shore power coming to it. Since I anticipate my entire 12V system will be using no more than 8-10 amps, I want to know if 10GA or 12GA wire from the batteries to the distribution fuse panel will be sufficient. The distance will be under 8'. Wire rating for a 30 amp circuit is #10 and that is what I'll use for my shore power input. I'm just not sure about my 12V system wiring from battery to distribution. I will be using a CS6000 converter/charger, and don't know (as I don't have it yet) if the wiring runs from the converter to the battery, and then to the distribution fuse panel, or just to the panel. But, that will be cleared up when I get it and read the manual. I used 6 Ga. from my battery to the fuse box. The distance was about 14 inches. I used 10 Ga. for my 300 watt inverter circuit, fused at 30 amps. I used 12 guage for all my other 12 volt circuits. I had sent you a PM on this very subject earlier tonight, how weird is that? I would always use thicker wire than the minimum, this avoids voltage drop now depending what you are running this can be important, I always spec higher as Voltage drop means unwanted heat in the wiring. Here's the reply that I just sent to your P.M. I only plan on using low-wattage devices like radios and CD players when running off the inverter. Anything larger will drain my battery in a very short time. I think I'd rather blow a fuse than draw down my battery. I'm no electrician. But, common sense tells me that as long as I fuse the circuit according to capacity of the wire, I should be OK. I'm finally wising up and saving these threads in my favorites, under Camping/Electrical. Don't know why I didn't think of this before. It's such a hassle to try top find info you know you've read before. I follow your reasoning re battery drain and fuse/wire size, but if all you ever intend to use is items rated at under 50 watts, why not get a 100w rated invertor? There are several good reasons for changing that invertor for a smaller one. After exhaustive research, I have found that Invertors operate at their maximum efficiency when used at 50% of the continuos rating (usually 93% eff on good brands) If you operate at full tilt they drop eff and also if you under utilise they are even worse. At low output like using a radio on your invertor typically between 50 and 67% eff ie thats 33% to 50% more power going up in wasted heat! With all the wire charts published here, remember that this is only for short runs and using a larger size for each ampage reduces the voltage drop, for a few ounces more the lights wont brown out when the pumps running and the TV wont shut down early. I figured the ability to run a 200 or 300 watt device for very short durations might come in handy some day. Like I said before, anything larger will kill my battery in short order. That's how I arrived at 300 watts. I didn't consider the efficiency for low wattage devices at the time I bought it. At this point, the inverter is installed. It works. I'm not about to rip it out and replace it. Last edited by TomS on Fri Oct 07, 2005 8:01 am, edited 1 time in total. Powderburn, the code stated "G) Luminaires (Lighting Fixtures). All low-voltage interior luminaires (lighting fixtures) rated more than 4 watts, employing lamps rated more than 1.2 watts, shall be listed." (See, I did read it all...helpful info). What does "shall be listed" mean? Listed where? I've considered a small plun-in inverter just to power the TV/VCR unit we will probably use. It is rated at 65wats according to the info stamped on the rear of the case. From what I have read, I'm not sure that a 100 watt inverter will suffice. I saw this 200 watt inverter and it looks like it would work...and it's Coleman. Do you think the 65 watt tv would work efficiently on a 100 watt? Or would need the 200 watt unit? Could this be construed to apply to the light on my galley hatch? Ceiling luminaires (fixtures) in camping trailers shall be automatically de-energized by an interlock when folding down the trailer, or it shall be physically impossible to fold down the trailer unless the ceiling luminaire(s) (fixtures) are disconnected. Can you still buy the "mercury" switch or something similar to put inline between the power source and the light switch? If mounted on the inside of the hatch, it would automatically cut off the power source when it is closed. Wouldn't this meet those code requirements? "(4) Location. The overcurrent protective device shall be installed in an accessible location on the vehicle within 450 mm (18 in.) of the point where the power supply connects to the vehicle circuits. If located outside the recreational vehicle, the device shall be protected against weather and physical damage. Exception: External low-voltage supply shall be permitted to have the overcurrent protective device within 450 mm (18 in.) after entering the vehicle or after leaving a metal raceway. " 1) Does the first paragraph apply to AC or DC, or both? If AC, I would think it means that I need my main circuit breaker within 18" of where the power comes into the trailer. Yes or no?. I plan on getting a 10ga shore power cable and wiring the socket end directly to a 30amp breaker in a small box where the cable enters the trailer. That will be in the battery box on the tongue. The cable will be coiled in the box when not in use and pulled out through a weatherproof opening (sold by RV dealers for that purpose) to be used. So, if my shore cable is wired directly to the 30 amp breaker, does it have to be within 18" of the wall? I don't understand the 18" limit, since it is a continuous 30' or 35' cable connected between the shore power connection and the breaker box. 2) If DC, I'd think it means that I need a fuse between the distribution fuse panek, located near the battery. Yes or no? 3) I am not sure that the 2nd paragraph apllies to my electrical system. Ok, TV's are rated with everything on MAX ie Volume Brightness colour everything wacked up to full tilt, of all the TV's I have ever tested, Not one as ever come close to its rating at normal volumes etc your 65 will probably be about 40w in normal use if my findings so far are anything to go on and thats with VCR rolling too. The only problem that may occur is that some Combo TV/VCR and TV/DVD units do not like running on Modified/quasi sine wave invertors. Can you try your TV on a friends invertor? If it doesnt work it's due to the Thyristor control on the joint power supply, to be honest I have only heard of one combo not working all the ones I have tested and seen in operation have been fine. ie less than 1 in 20 will not work (so odds are in your favour) at worst you would have to get a pure sine wave invertor. Only passing on the info, its of course down to you what you do, only passing the info so you can make an informed choice while in possesion of all the facts. 10 gauge is off course spot on for 25 Amps (300 watts) Not sure on US codes, but in UK it would be against regs to use cable thats rated for less than half the max possible capacity. Looking at the regs that powderburn posted it looks like American regs would reccomend 6 Guage or better, if you follow the codes through (700 W inverter would need 65 Amp wire(700/12*1.1 to allow for eff) Maybe Powderburn can confirm or refute that based on the USA regs. I avoid locating fuses close to the battery due to their explosive nature, I have never understood people putting a fuse near them. In the UK and many other countries, when electricians talk about low voltage they are talking 240v (between 49v and 500v) and ultra low voltage is 48v and below. Thanks for the information and advice. If I was in in the planning stage of my electrical system, I would consider a smaller inverter. I'm way, way past that stage. In fact I'm very close to completing this project. I just want to finish the damn thing and go camping. Besides, I'm really not into throwing away money. For now, I'm comfortable my choices regarding my inverter curciut. I am however considering adding the following items to enhance my personal safety and the safety of my project. 1. A master kill switch on my battery's positive lead so I can turn off power to the entire trailer while towing. I figure if a wire is going to pop loose someplace and short out, it'll happen while I'm towing. 2. A smoke detector to be mounted on the cabin ceiling. 3. A small ABC fire extinguisher to be mounted under the galley counter.